This lovely lime-green foliage plant is another of our potted garden babies. 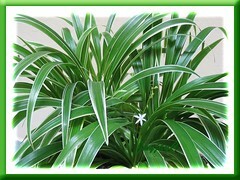 It goes by the cultivar name, ‘Bichetii’ or ‘Variegatum’ and is the commonest variegated form of Chlorophytum laxum in cultivation. 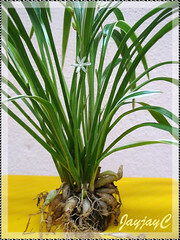 Popularly grown in home gardens, this petite herb plant is quite similar to Chlorophytum comosum, another species in the genus, Chlorophytum. 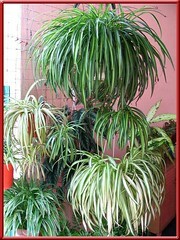 Though not as attractive without the long arching stalks of ‘baby spiders’ or plantlets which is so characteristic of the real Spider Plants, it is sometimes known too as Variegated Spider Plant or Dwarf Spider Plant. Is it a mistake, I wonder? Nevertheless, it does look pretty when planted in hanging pots amongst a crowd of other variegated spider plants, adding variety as seen in the right image of our garden porch. An easy-growing plant that multiplies readily from its tuberous roots, providing extra plants that can be given as gifts to friends and neighbours. Isn’t that great? Be aware that it is a non-acquatic plant that will rot quite quickly if submerged in an aquarium and likewise if emersed. So, don’t be fooled by the aquarium plant suppliers! Plant type: An evergreen herbaceous perennial, native to South Africa but widespread elsewhere in tropical Africa, India, Sri Lanka, China, Myanmar, Thailand, Malaysia, Indonesia and Northern Australia. Features: Chlorophytum laxum is one of more than 200 species of the genus Chlorophytum, mostly cultivated in India for its edible leaves and roots that are used as traditional medicine. Its foliage is solid green without variegation, unlike its variegated cultivar ‘Bichetii’ or ‘Variegatum’ which is popularly grown for its ornamental beauty. C. laxum ‘Bichetii’ is an evergreen clump-forming variegated species that is moderately fast-growing and petite in stature, about 30cm tall with a spread of 60 cm or more on ground but less if contained in pots. Exhibiting tufts of lovely lime-green grass-like recurving leaves with thin ivory-white margins. Leaves are slender and elongated with tapering tips, paper-thin, smooth and shiny, distichous and sessile, ranging between 10-40 cm in length and up to 1.5 cm broad. It bears tiny inconspicuous star-shaped 6-petaled flowers in white on a 10-20 cm non-arching scape (flowering stalk) that is almost erect. It does not produce ‘baby spiders’ or plantlets on the wiry scape but does set seeds though rarely. It has a short rhizome which produces fleshy tuberous roots as a cluster of whitish bulblets from which new plants emerge. Light: Medium light, partial shade or filtered sunlight will be best. Avoid strong sunlight as its delicate leaves are easily dehydrated and get shriveled up in the heat, loosing its shine and color tarnished. Moisture: Does well with regular watering and allow soil to dry slightly between waterings. Needs humidity and fresh air too to do well. Soil: Well-drained sandy to loamy soil though adaptable to any kind of garden or potting medium. Others: Feed every 2 weeks or once monthly with a balanced fertilizer for foliage plants at half strength. Pull out withered or discolored leaves to maintain tidiness. Be aware that too little water, too low humidity, too much salts and excess fluorides in the water can cause leaf tips to turn brown. Mist leaves occasionally to provide humidity, if necessary. Preferably water them with rain water or aquarium water. It is susceptible to root rot if waterlogged, otherwise least bothered by pests and diseases. For temperate regions: USDA Zone 9-11. More information at Dave’s Garden. Propagation: Easily propagated by dividing the plants which include the rhizomes and tuberous roots at the crown. Best to do it when repotting in spring. Remove all the dried and yellow leaves first. Next, dig it out of the pot and divide the clump of plants at the crown by cutting right through into the soil with a garden spade. Shake off excess soil from each division and then pot them individually in a pot of growing medium. Water the repotted divisions thoroughly and locate them in a warm, semi-shaded position. With proper care, these resilient plants should flourish easily. 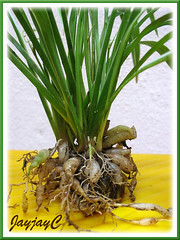 Wheat Plant can also be propagated from seeds, though they are rarely available. Usage: C. laxum ‘Bichetii’ make excellent container plants, be it as a houseplant or outdoor in the garden, deck, patio or porch. It is perfectly showy in hanging baskets or planter boxes with a mixed crowd of foliage plants. Ideal too as a groundcover in garden beds or borders. Being petite and easy-growing, it can be grown well in terrariums and as a marsh plant, in vivaria. In India, the leaves of Chlorophytum laxum are eaten while the roots are used as traditional medicine to treat diarrhoea and dysentery and also used as demulcent and galactogogue. Note: there’s a lot of contradictory info in the internet regarding this pretty plant. 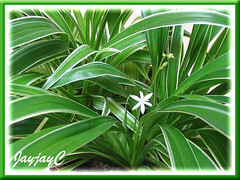 Some have named it as Chlorophytum laxum ‘Bichetii’ or ‘Variegatum’ and others, Chlorophytum bichetii or Chlorophytum bichetii ‘Siam Lily’. It’s so confusing! Nonetheless, for this article, we chose to temporarily identify our plant with the first mentioned name until proven wrong and we’re not responsible for the accuracy of information herein. Chlorophytum comosum ‘Variegatum’ can be eye-catching too! Thank You for the info on wheatgrass. You’re most welcome, Delcie Blakney!